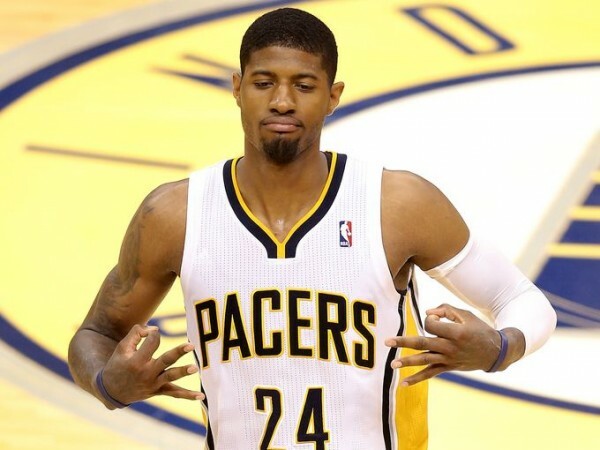 In a game 5 with wild momentum shifts, an incredible shooting performance from Paul George and an astonishingly bad one from LeBron James when he was actually on the floor, the Indiana Pacers managed to beat the Miami Heat 93-90 and stay alive in the Eastern Conference Finals, heading for a road game with the Heat leading 3-2 in the series. So what did we have? The Pacers needed a career night from Paul George with 37 points on 45 minutes, the Miami Heat to be plagued with foul trouble that meant LeBron James out of rhythm and playing only 24 minutes while shooting 2-of-10 from the field, to win by only three points, luckily escaping the outside wrath of Chris Bosh, missing a shot that could have won the game on the Heat’s final possession as Miami ran a bad finishing play. The first half, despite James not playing, was proof of just how good Miami are. Rashard Lewis wasn’t just one the floor to stop David West, but hit 3-pointers like he was playing next to Ray Allen with the Seattle Supersonics. Lewis hit six three pointers to score 18 points and once again do a very good job on defense when asked of it, stepping up during the second quarter run before the break and as the Heat came back in the fourth quarter with James back on the floor. 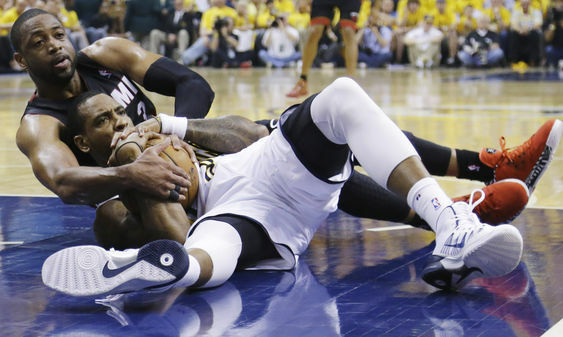 As Paul George traded 3-pointers with everyone on the Miami Heat, it came down to a 91-90 lead for the Pacers, as David West was sent to the line, giving the Heat time to make one decisive play. West made only one of two, and the Heat had around 12 seconds after the time out to hit a game winning shot, which everyone assumed they’d be going for. The Pacers guessed right and didn’t do a lot when it came to protecting a two-point shot, knowing Miami are going for it all after hitting 14-of-30 up to that point. LeBron James drove to the basket and kicked it out to Chris Bosh on the corner, but there was just enough interference to make him miss, as West was sent to the line with the rebound to clinch the game. Officiating, sadly, was once again a big part of the game. The Pacers went more inside, to Roy Hibbert and David West, especially early on. Hibbert finished with 10 points and 13 rebounds. He missed quite a lot, but didn’t zone out like he did in the previous game, as the Pacers had three players with more than 41 minutes and all the starting five on 38 or more. They got more to the line, but at least two of the five fouls on LeBron James wouldn’t have been called if it wasn’t for the pressure on the refs from the Pacers before the game, but that wasn’t it. With the Pacers in the lead and inbounding the ball, 16 seconds left on the clock, Shane Battier jumped Paul George from behind and deflected the ball off of him. It should have been a Heat ball as it went out of bounds and the referees went to review the play, keeping it in Indiana’s hands for some reason. The next play, Battier didn’t commit a foul but Paul George fell on him, getting an away from the ball call, giving the Pacers a free throw which George missed. Justice? The Heat still lost. Lance Stephenson had a weird game. He enjoyed not having James next to him, but used some borderline embarrassing to effective tactics, like blowing in James’ ear, fouling him in a way officials stopped looking and somehow, besides his 12 points, walked away without getting at least one technical foul. He might be a dirty player, flopping three or four times during the game, but in the grand scheme of things, at least in this game, his ploy worked. The Heat shouldn’t feel bad about the loss, but they need Chris Andersen back, or start using Greg Oden for a few minutes. Chris Bosh was very good an influential, but the minutes without him were crucial for the Heat and might have cost them the win. Things will be very different in Miami, and we’ve yet to see the Pacers playing well twice in a row. Unless Paul George has another huge second half up his sleeve, his great effort in game 5 might not be enough for the improbable comeback.